This product is the Croft Edition for Shadow of the Tomb Raider version of PS4 and includes a number of very succulent extras for fans of this franchise. With this edition of Shadow of the Tomb Raider we can access 48 hours before the release, so we can play 2 days before. It also includes an exclusive Steam poster and an additional skill enhancement package. It also includes the Season Pass of the title, with which we will have access to all the DLCs that are launched, access to the original digital soundtrack, and 3 additional weapons and costumes for Lara. Remember that digital versions of console games can be regionally locked, so we recommend that you read the information in each store carefully. 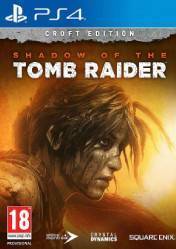 In addition, special versions of games, such as this Croft edition of the upcoming Shadow of the Tomb Raider, may vary the bonuses depending on the format in which the game is purchased. There are no comments yet about Shadow of the Tomb Raider Croft Edition. You can be the first one!